Recreate the biggest battles and missions in Star Wars with this lightsaber from The Black Series! Though largely self-taught, Luke Skywalker became a legendary master of the lightsaber, and imparted his skills to the generation of Jedi that followed him. Ignite the glowing, bright blue blade with realistic power-up and power-down light effects and four authentic lightsaber sound effects that have been digitally recorded from the movie including power-up, idle hum, clash and power-down. 3 built-in motion sensors for super sensitivity: 2 for detecting movement and 1 for detecting the impact of the blade. A durable metal hilt looks and feels like a real lightsaber, along with a sturdy, permanently attached blade. 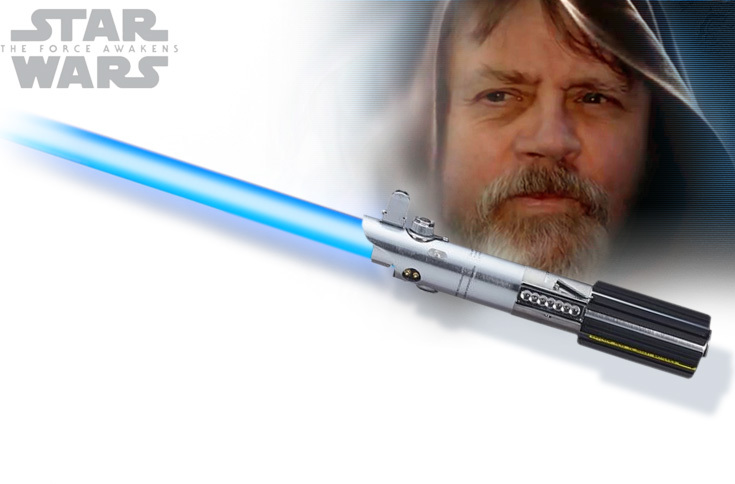 A true recreation of the most awesome weapon in Science Fiction made from the highest quality materials using the LucasFilm archival information, it's just like the real thing. When not in your grasp, proudly show off your galactic weapon in the specially designed base that allows two positions of display.